What is the Virtual Flight software program? Virtual Flight is a multimedia simulation of the entire flying and flight experience from arrival at the terminal to arrival at a holiday destination. 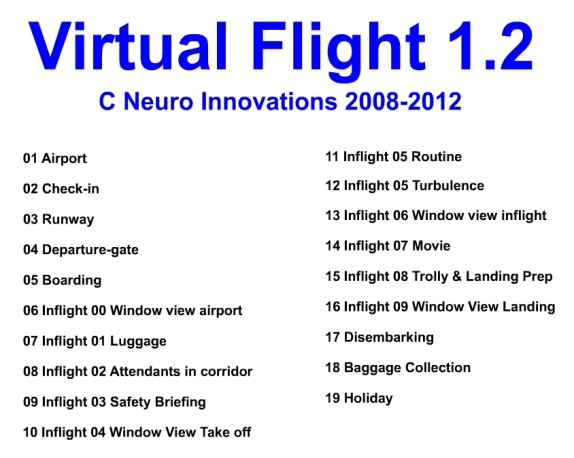 The virtual flight is broken down into 18 different sections to facilitate easy desensitisation at the speed that is correct for the individual. The flying experience is emulated by a series of fullscreen photo slideshows with aircraft background audio during the flight itself (including the inflight announcements). Approx 100 photos taken on real flights were used to create the Virtual Flight. The quality of the images (1024 x 768) and stereo audio is excellent. How to use the Virtual Flight software utility? Therapists: Enable your patient to enter into some form of relaxed state of mind and body, then gradually introduce material from the Virtual Flight encouraging relaxation / safety throughout. Proceed to the next section only when the SUDS for the current section have been substantially reduced, ideally to under 3. Self-desensitisation: On a regular basis play the various sections at the same time as using some form of relaxation technique. Ensure that your breathing is regular and that you are doing something positive with your self-talk. 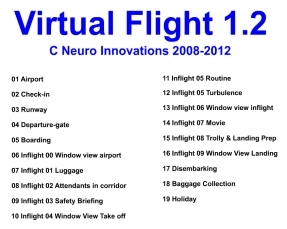 Continue until your can experience the entire virtual flight without significant distress. A Mac specific version is available. As of Feb 2010 a Mac specific version is available. Online: Click here to access our secure online store to purchase and download. NB This is a large download of 30+ MB, if required order an installation CD in the shop.